"Witches can be right, giants can be good. You decide what's right, you decide what's good." 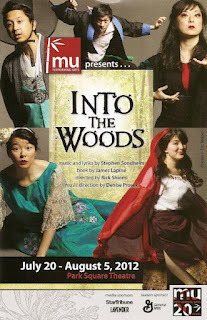 After seeing the Stephen Sondheim musical Into the Woods for the second time (the first being last year's production at BCT), I have an even greater appreciation of the cleverness of the piece. I love how it turns fairy tales on their heads and explores what happens on the other side of the "happily ever after." Does Cinderella get bored living the pampered life in the palace? Can you really get away with killing a giant without repercussions? Things are not always as straight-forward as they seem. In addition to the clever intertwining and re-imagining of fairy tales, the music is of course brilliant. Smart, fast, funny lyrics combined with unexpected and interesting melodies that sometimes don't fall easily on the ear, but that's what makes it so uniquely, brilliantly, Sondheim*. But something unique about Mu Performing Arts' production of Into the Woods is that director (and soon to be retiring Artistic Director) Rick Shiomi has "set the piece in the woods of Asia rather than those of fairy-tale Europe. Several of the classic western tales featured in this musical have equivalent stories in Asian cultures." And the shift works beautifully, shedding a slightly different light on these archetypal stories that are common among many diverse cultures, attempting to make sense of our shared human experience. And it's also a whole lot of fun. This is an intricate score and, I imagine, not an easy one to pull off successfully. But under the direction of Denise Prosek it sounds amazing, beautifully performed by the singers and the five-piece band that sounds bigger than it is. Randy Reyes and Sheena Jansen as the Baker and his Wife are the heart of the piece, and have a wonderful easy chemistry together. They both do a wonderful job filling in the little in between moments, such as when they frequently have to pause their dialogue to wait for the laughter to die down. Maxwell Chonk Thao and Suzie Juul are both adorable as the sweet but stupid Jack (and the Beanstalk) and the bubbly and willful Little Red Riding Hood. Alex Galick and Eric Sharp are appropriately melodramatic as the princes who enjoy being in "Agony" over the women they love, and for whom the thrill is in the chase (and kudos to Eric for also playing the dastardly wolf). Sarah Ochs plays Cinderella with a little more depth and spirit than in the traditional story, and beautifully sings the touching ballad "No One Is Alone." Last but not least, Katie Bradley is entertaining as the evil ugly old witch who transforms into a young and beautiful (but powerless) witch, and also has a poignant moment in "Children Will Listen." 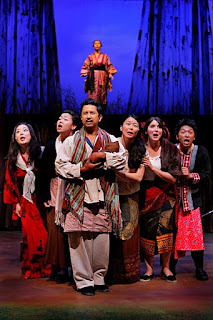 A really effective addition to the piece is the use of two Kurogos (played by Kim Egan and Bri Heu), traditional Japanese stagehands dressed in black who move set pieces and provide sound effects (such as a crying baby or a mooing cow). *For more Sondheim, see Theater Latte Da's Company at the Ordway McKnight Theatre and Sunday in the Park with George at Bloomington Civic Theatre, both opening in October.